Auckland Council Parks West has released plans for the lagoon area of the Piha Domain. Problems trying to be solved are particularly dust arising from the road and deterring young men from performing wheelies on the grass. This area of the Domain by the Lagoon is supposed to be for informal recreation and parking. The proposals would be implemented over two years, with the road and bunds in the first year. Do you think the works will stop bad behaviour? Will the works change the informal feel of the Domain? Will the works stop activities that happen in this area? Might there be unintended consequences eg faster cars on the driveway, new forms of “hoon” behaviour? Do you agree with more picnic tables? Is there an alternative to concrete toÂ replace the gravel pathway to the bridge? There is a Management Plan for the Piha Reserves which contains a lot about the Domain and can be seen here. This is the current management plan for the Domain. 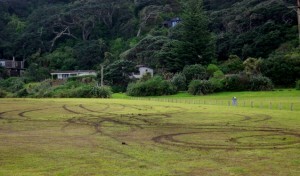 There are also Piha Design Guidelines that apply to this area. 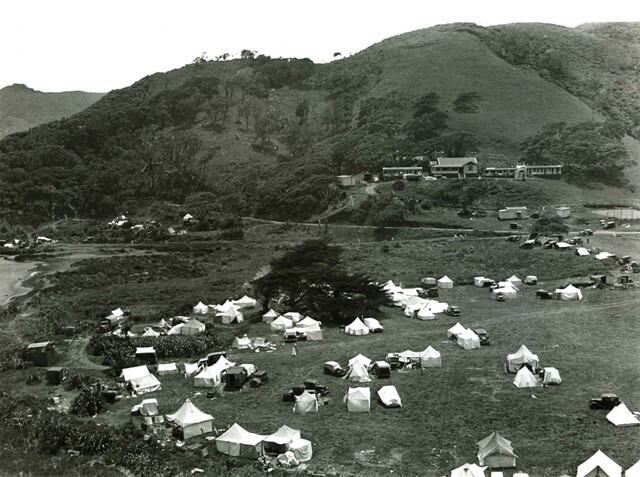 Have a look here for the history of the Piha Domain. And here’s a picture of the Domain about 1937 that shows that this area was once a wetland area, inundated when the tide came in. It has gradually been “reclaimed” particularly by dumping sand from clearing carparks on the beachfront.